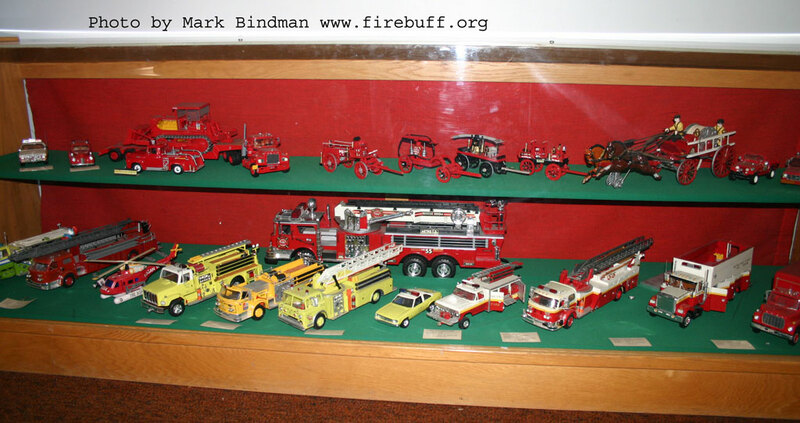 Thank you to my fellow members of the P.A.M. for permission to present this small virtual tour of the museum. 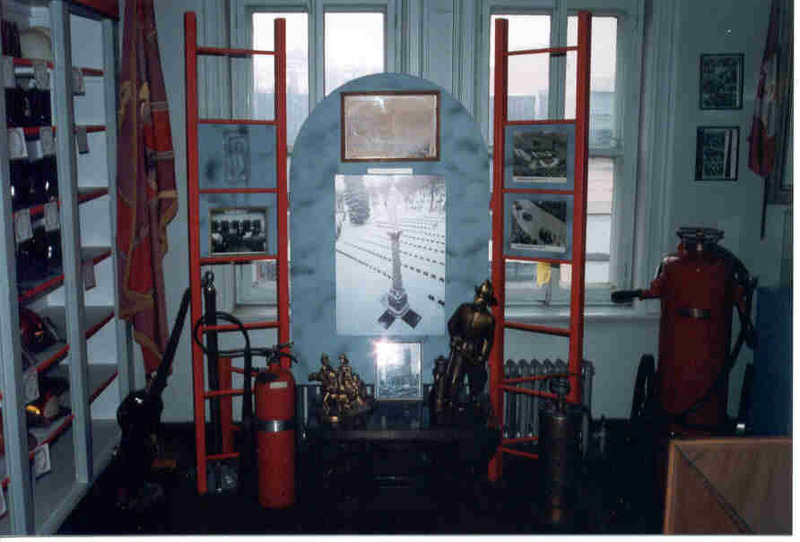 Please come and visit to see all that we have to offer. 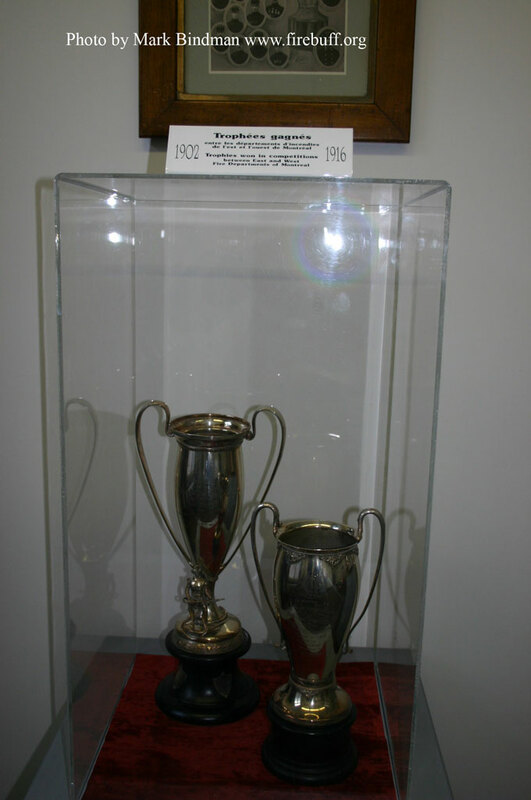 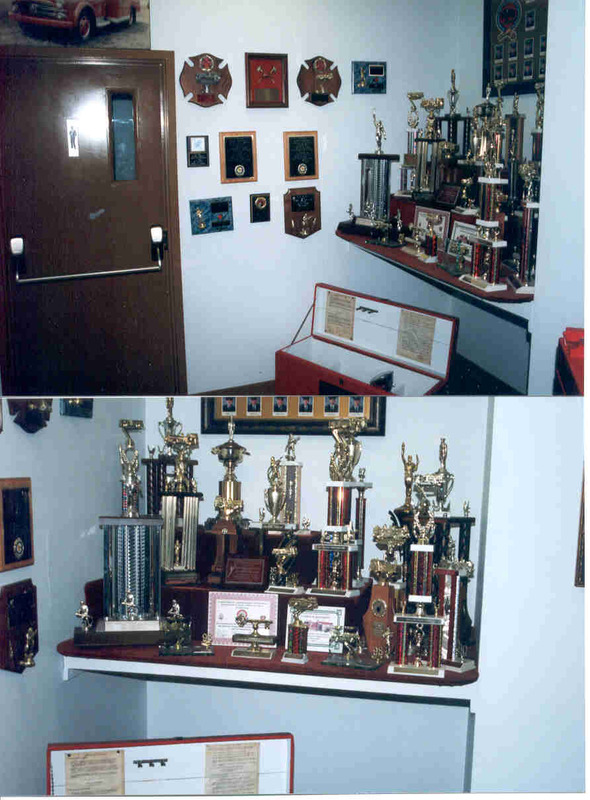 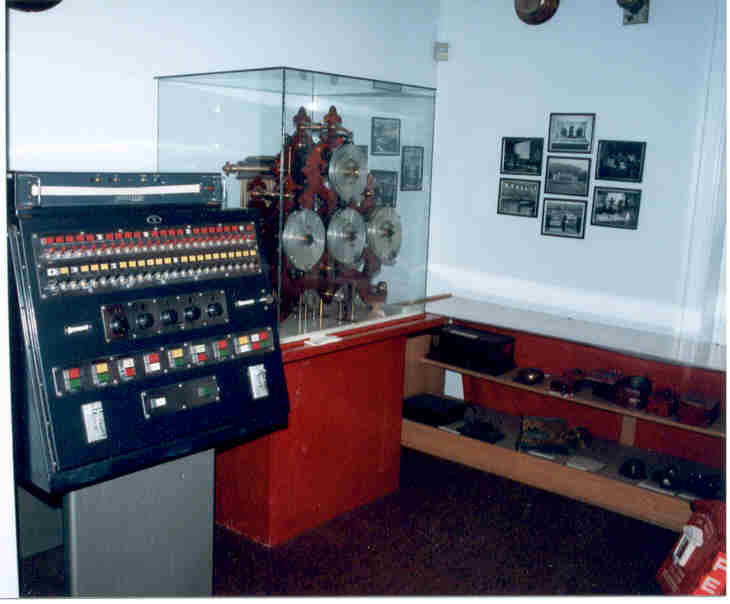 The following are some of the exhibits at the museum. 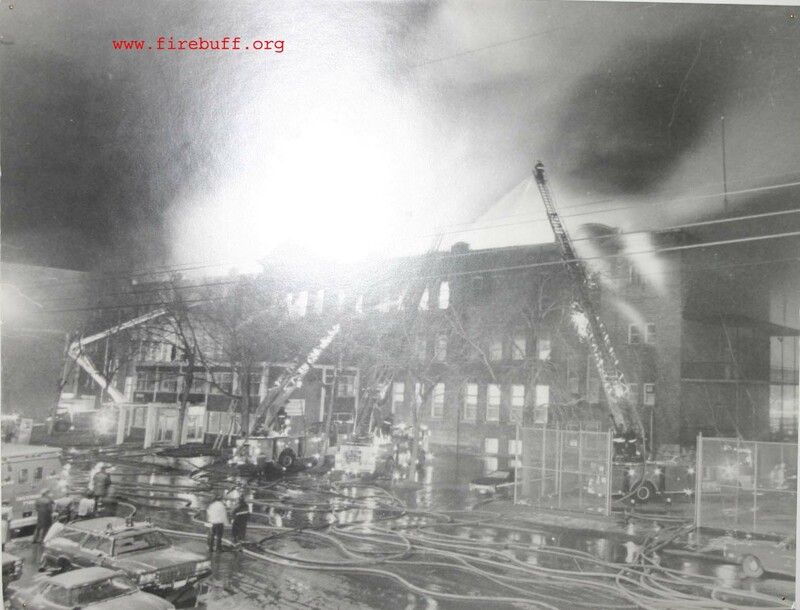 In addition, we have hundreds of photos dating back from over a hundred years ago until the current. 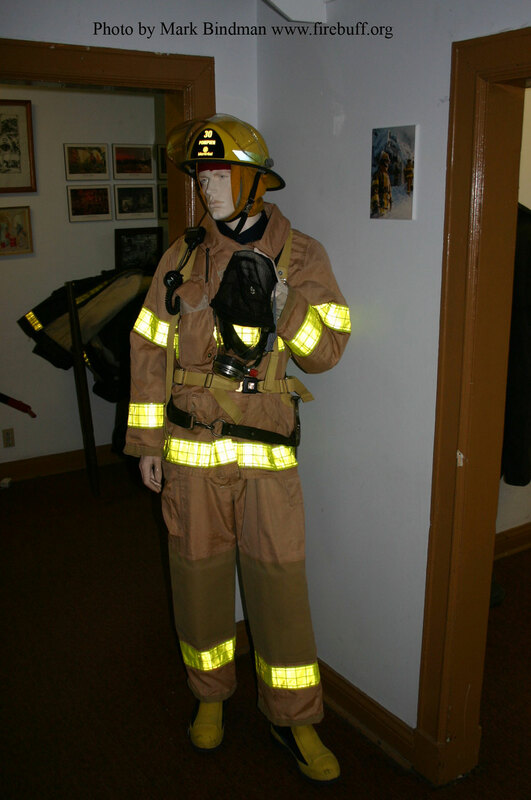 The exhibits change periodically so you are invited to visit more than once. 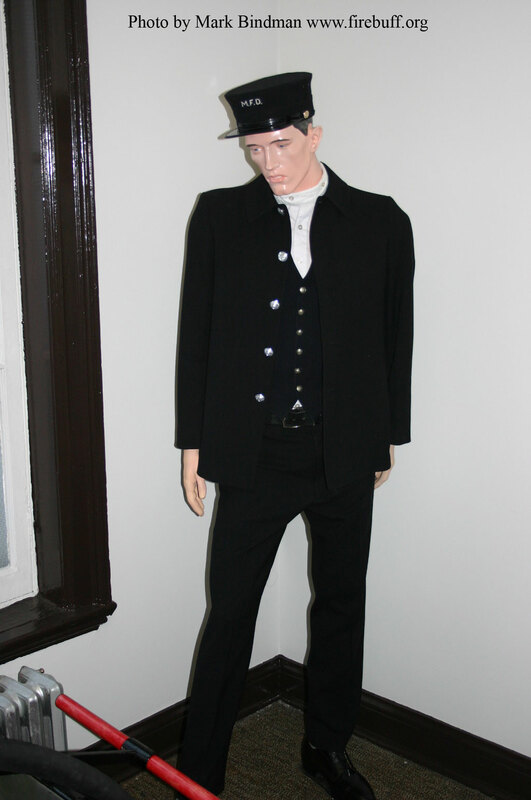 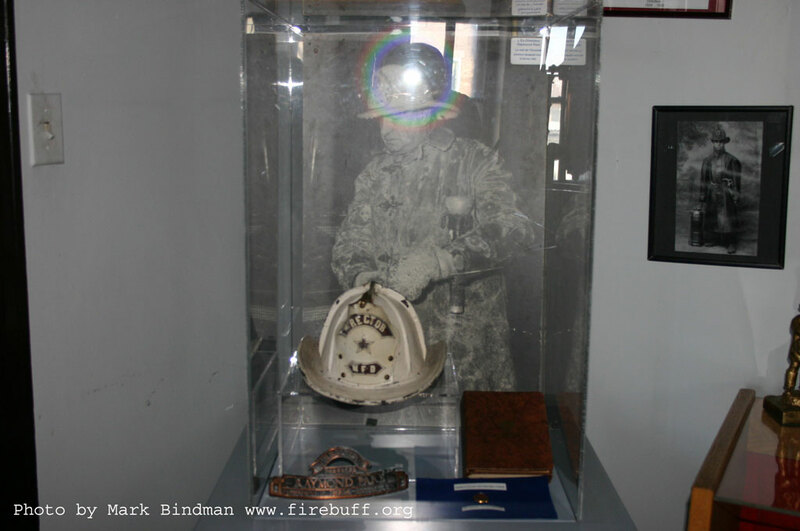 Click on the thumbnails below for some of the exhibits and artifacts on display at the museum. 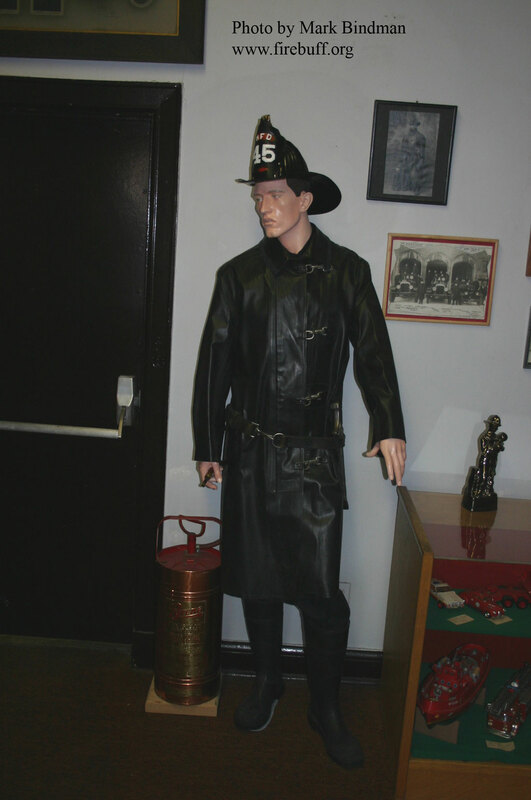 The museum is shares a heritage building with Station 30. 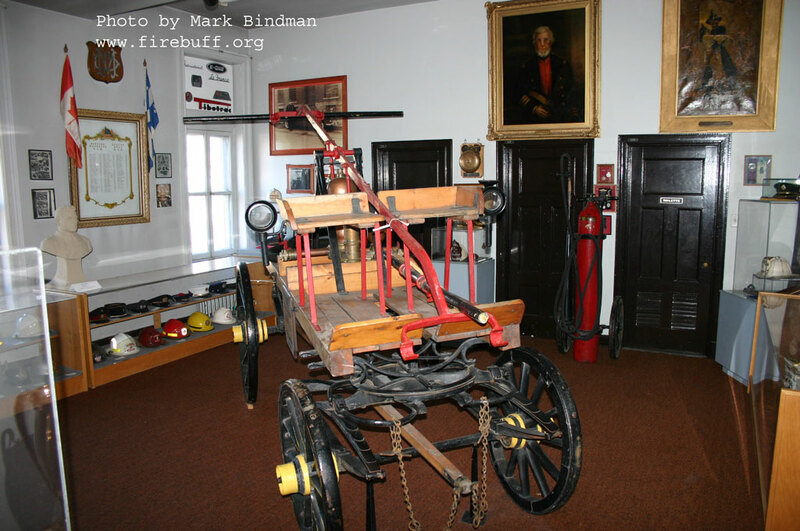 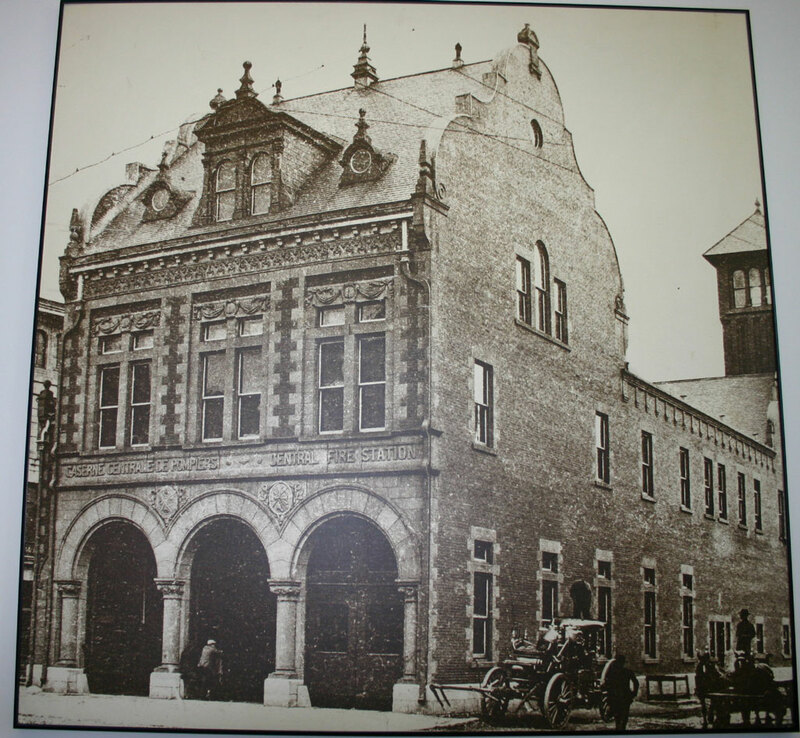 In 2005 Station 30 is celebrating its 100th birthday. 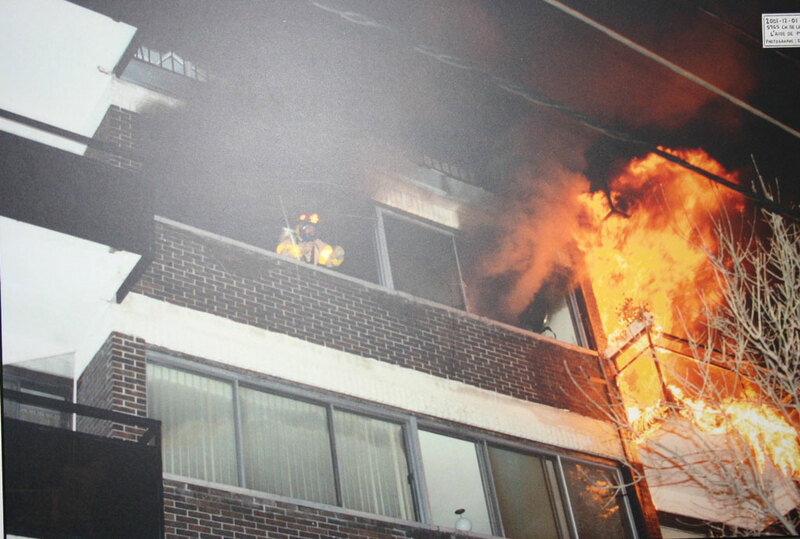 If you are lucky you can see the trucks leave for a call. 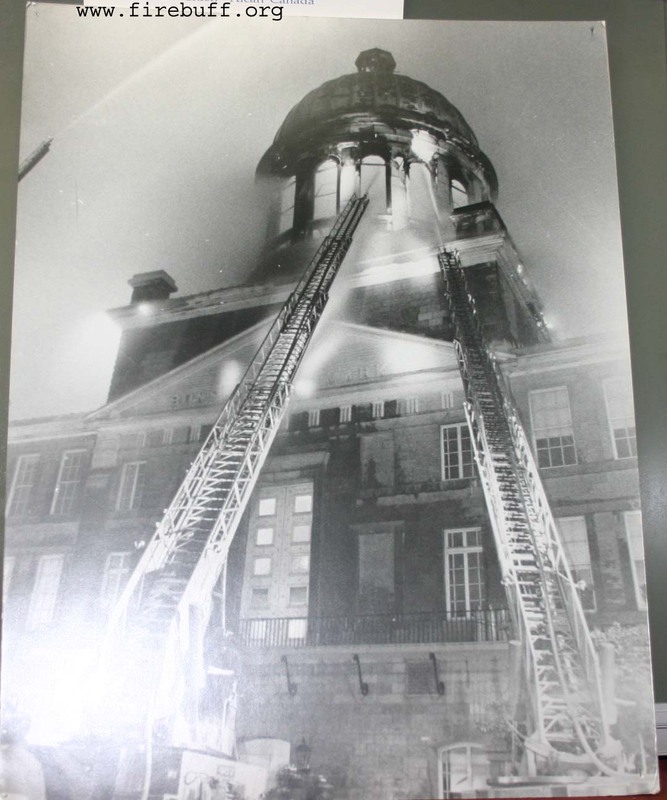 The building housing the museum and Station 30 was originally the city hall, fire station and police station for the Town of St. Louis which merged into the City of Montreal in the early part of the 20th Century. 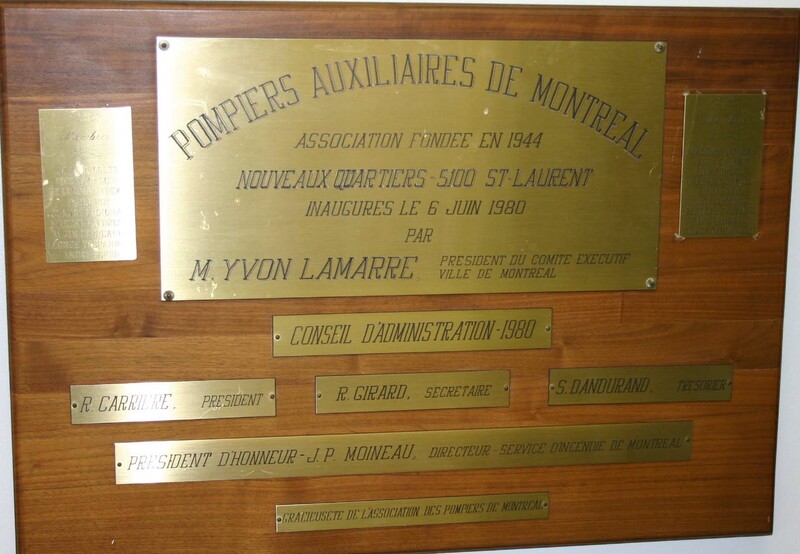 The Pompiers Auxiliaires de Montreal celebrated its 60th year of service to the Montreal Firefighters in 2004 with a grand parade. 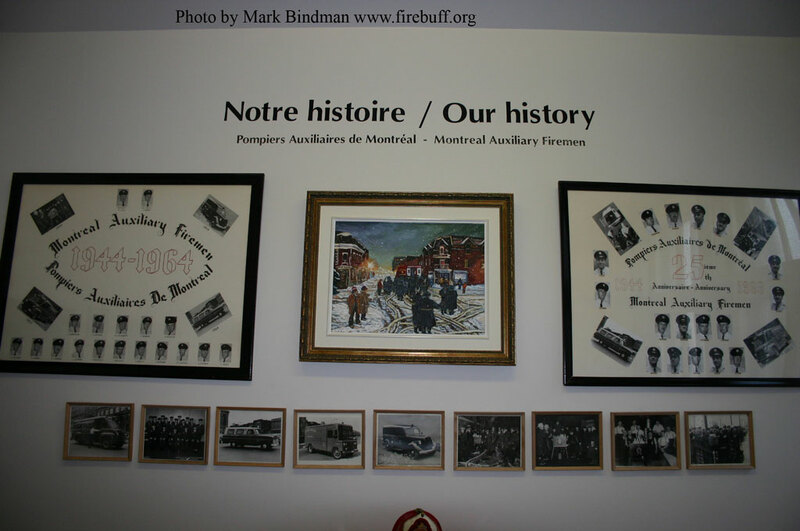 On January 1, 2002 all of the fire departments on the island of Montreal were amalgamated to form the new Montreal Fire Department (SIM). 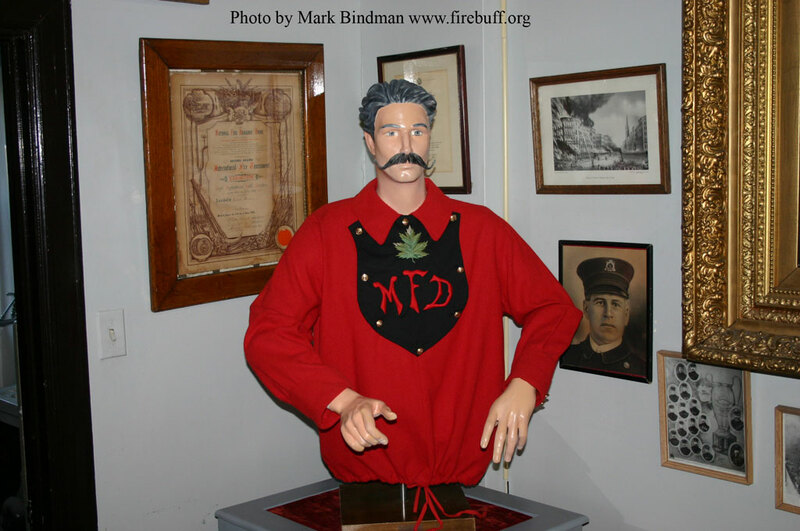 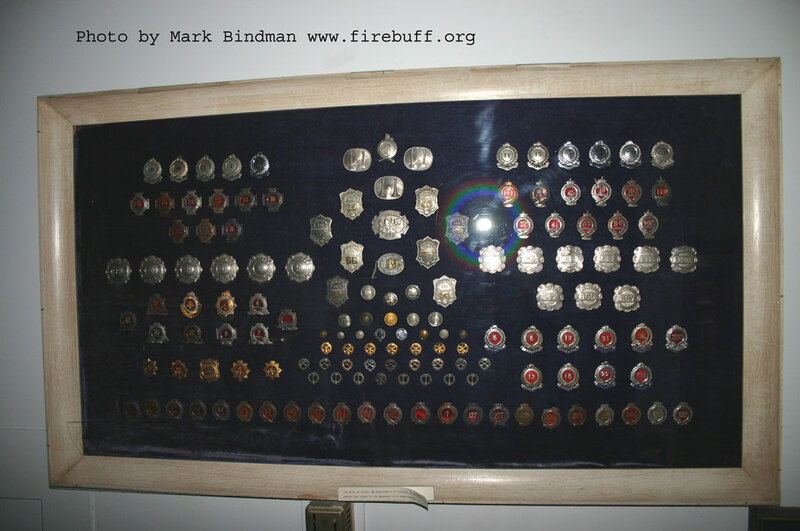 As you enter the museum, the exhibit presents a map of the island with the badges of the founding fire departments. 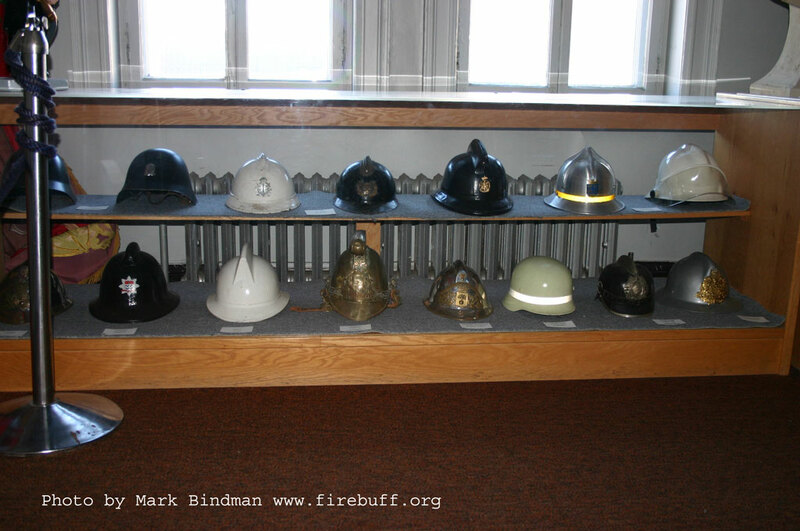 Overhead are the helmets of the former departments. 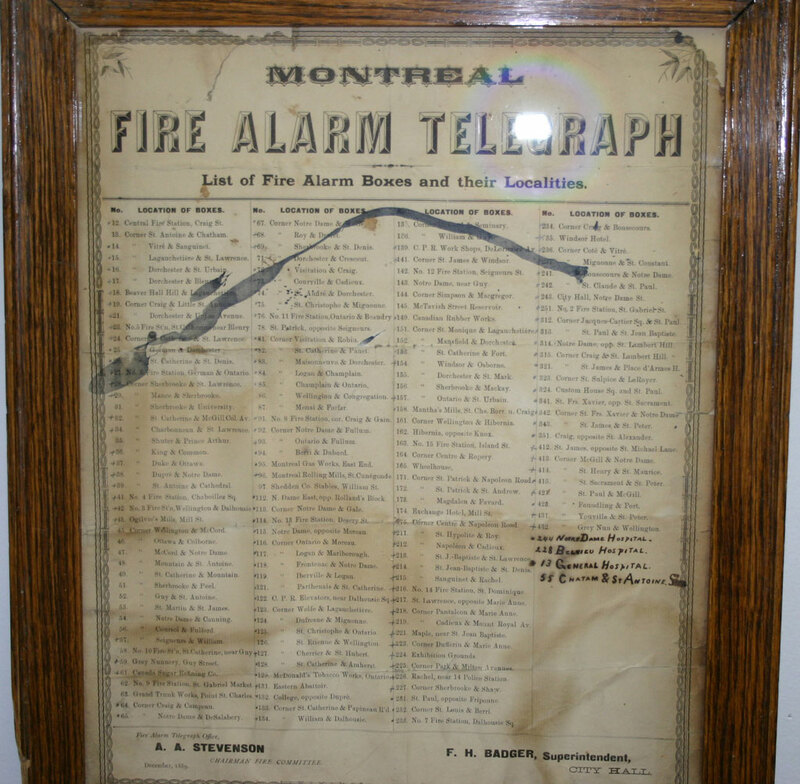 The alarm room contains pieces of the communication systems that used to be used in Montreal. 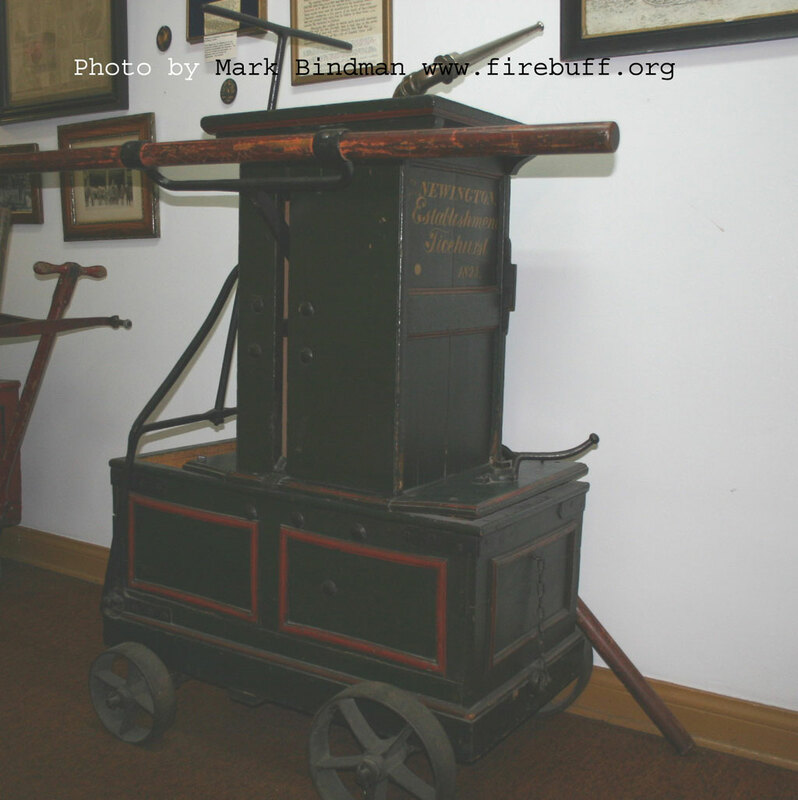 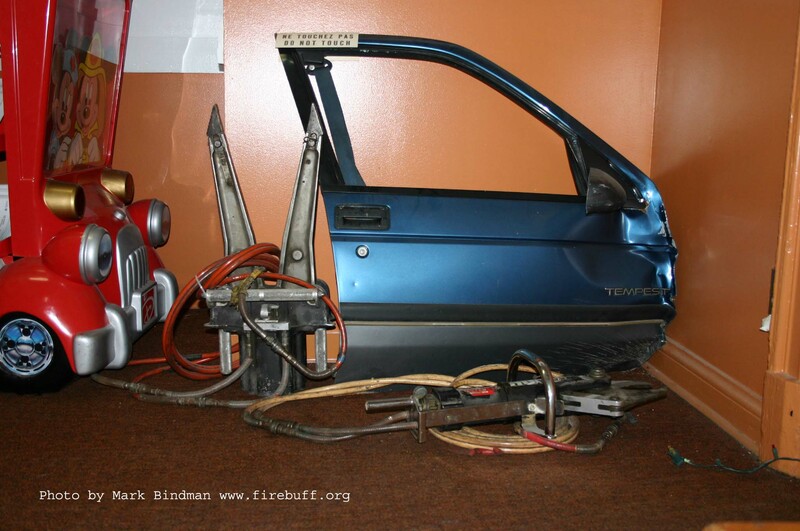 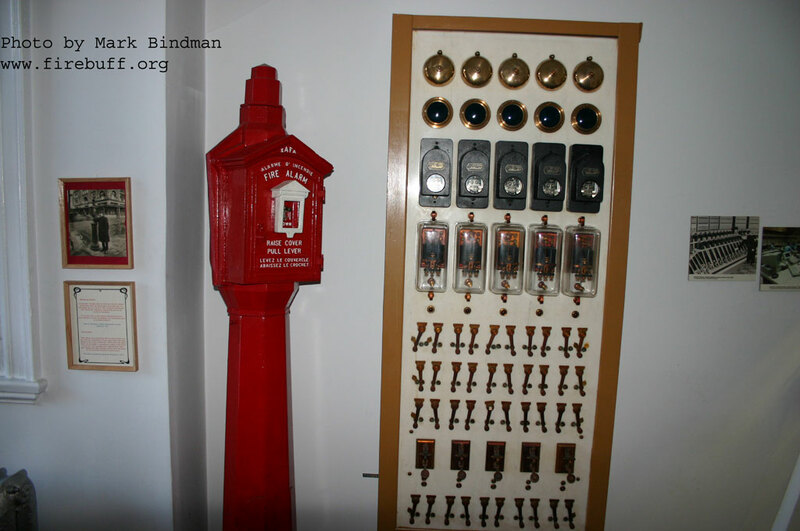 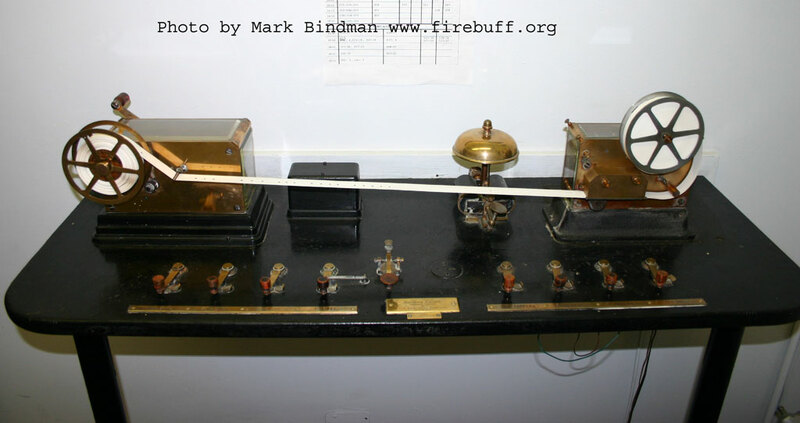 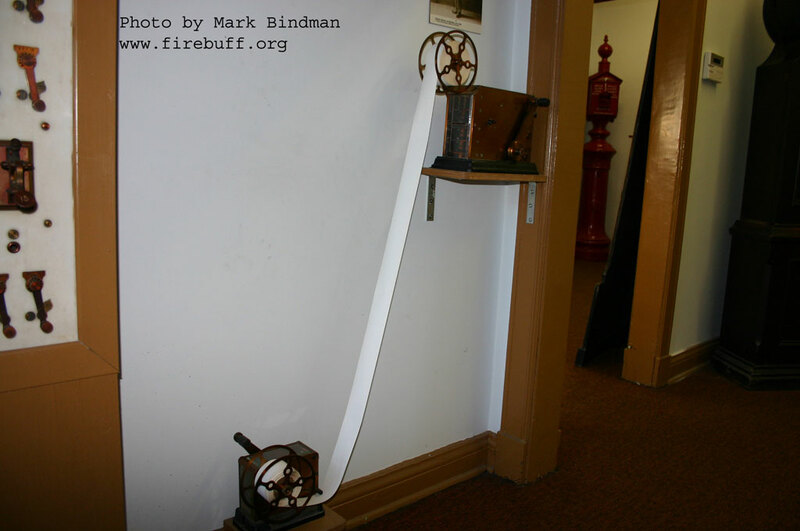 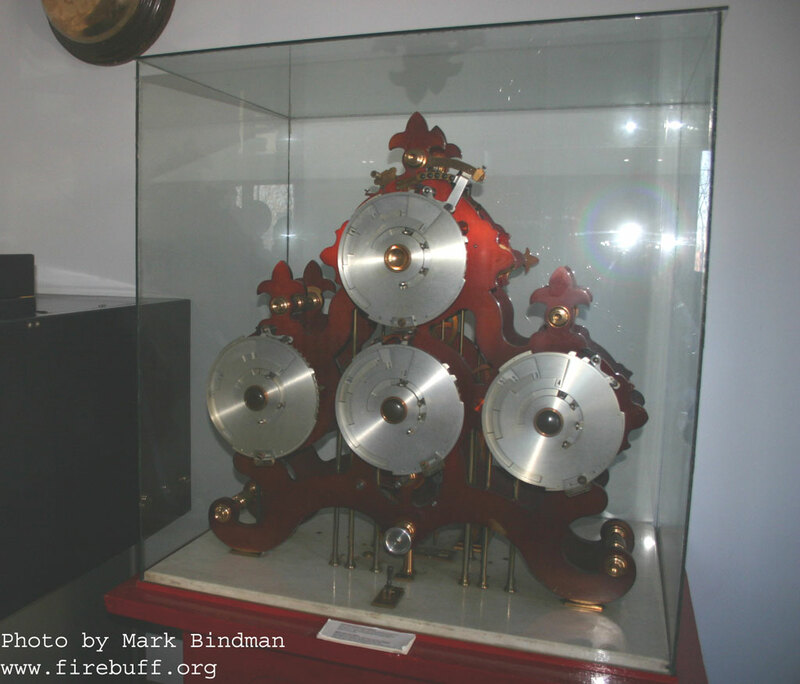 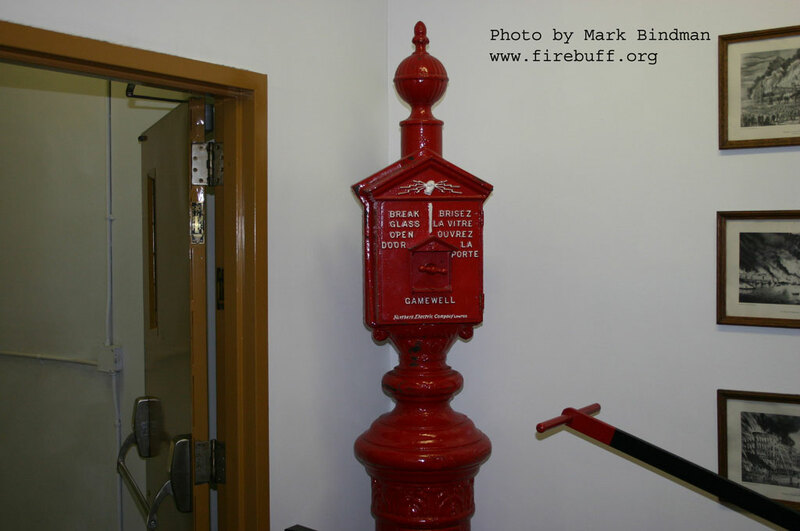 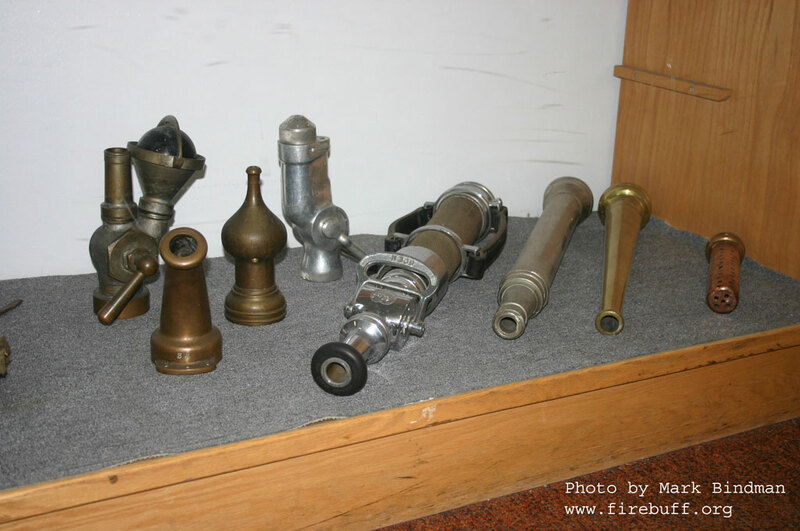 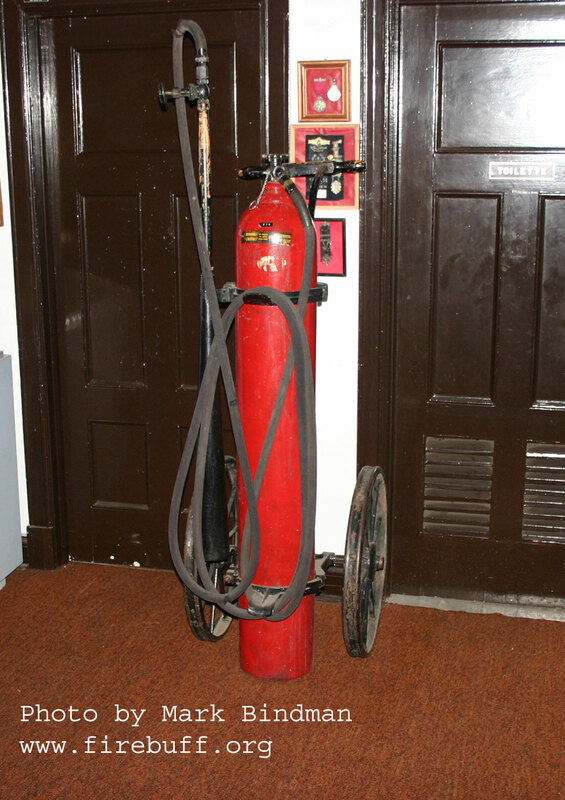 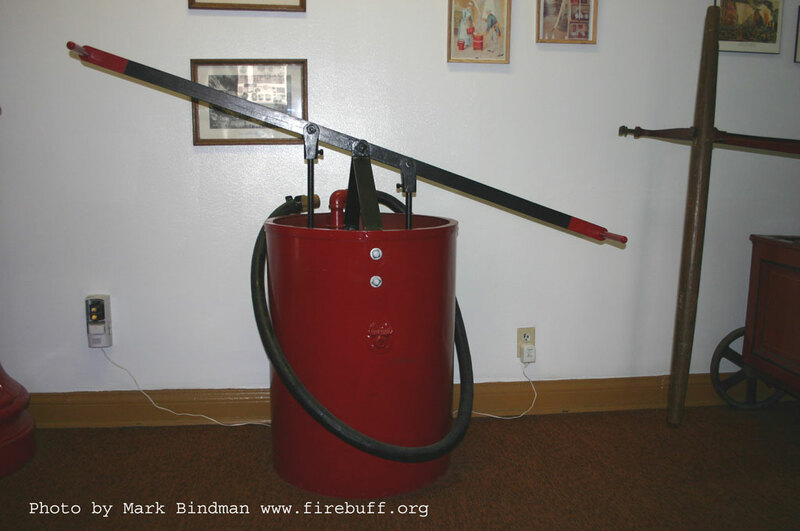 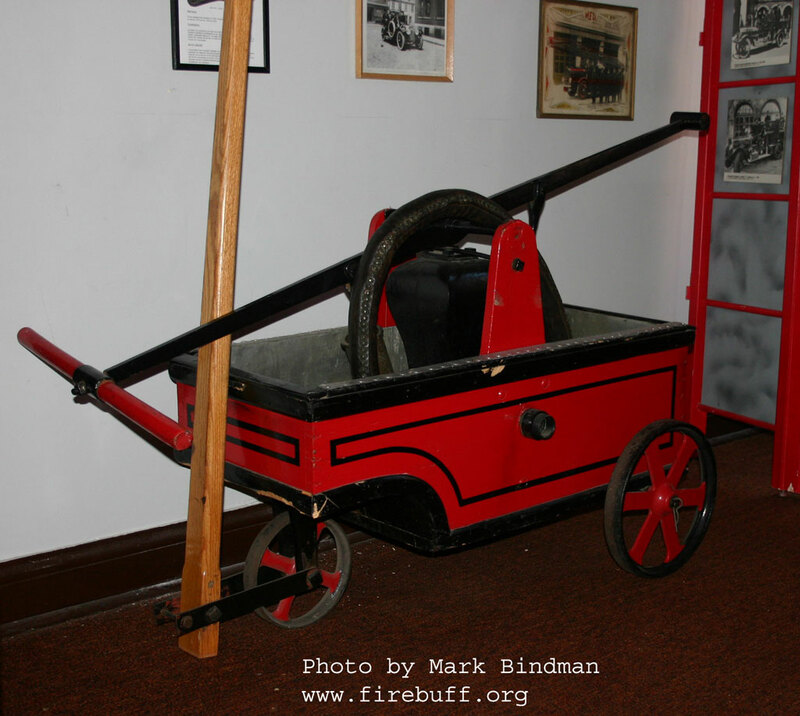 On exhibit are examples of old fire call boxes and a working alarm box and telegraph system. 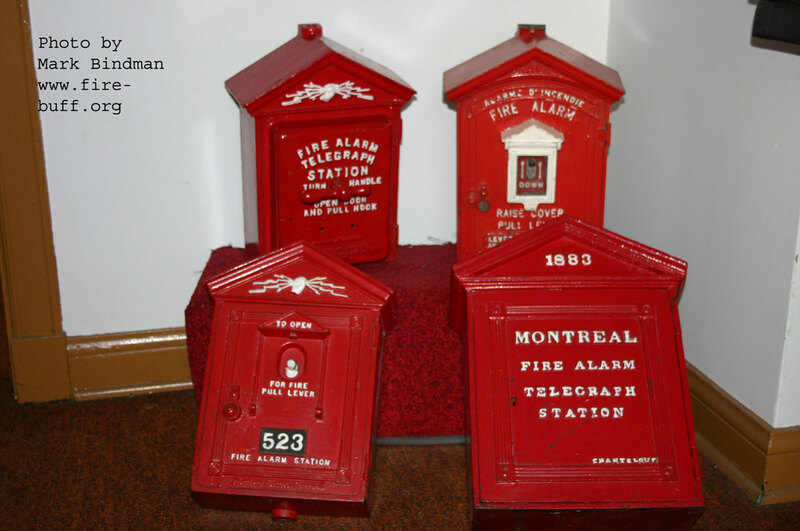 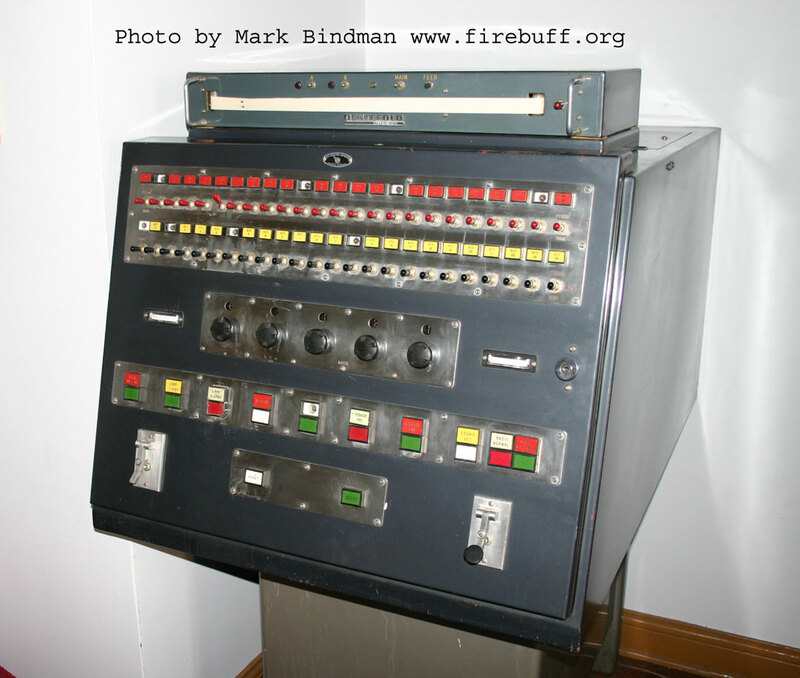 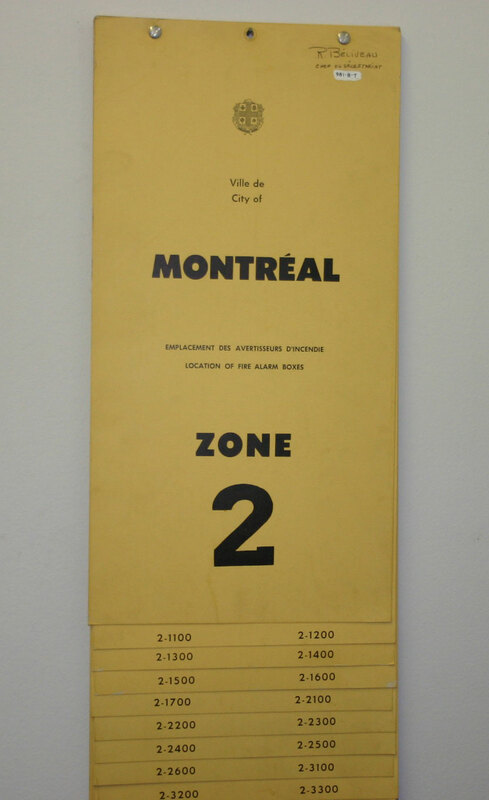 The call box and telegraph system was taken out of service in Montreal around 1975. 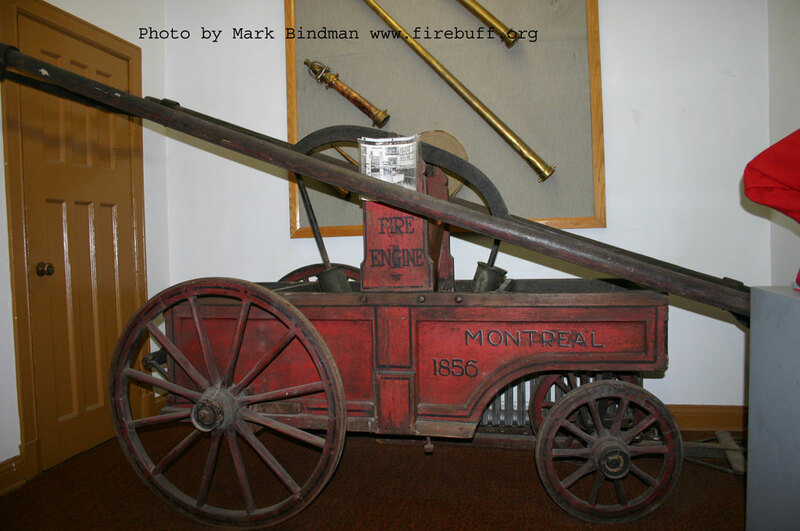 The museum shows off a number of old hand pumps This pump was one of the first "fire engines" in Montreal and dates back to the 1850's. 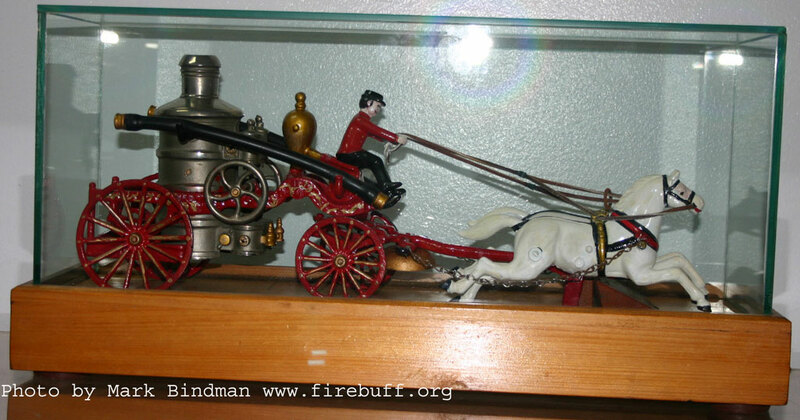 In addition we have a horse drawn steam engine. 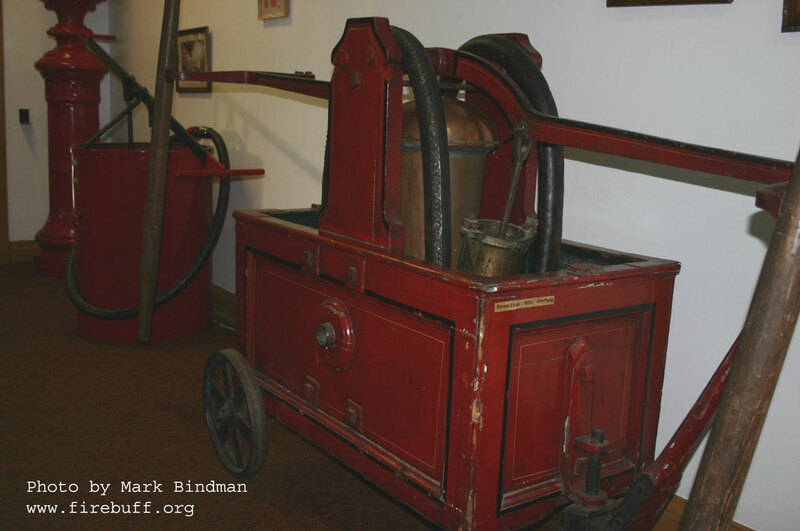 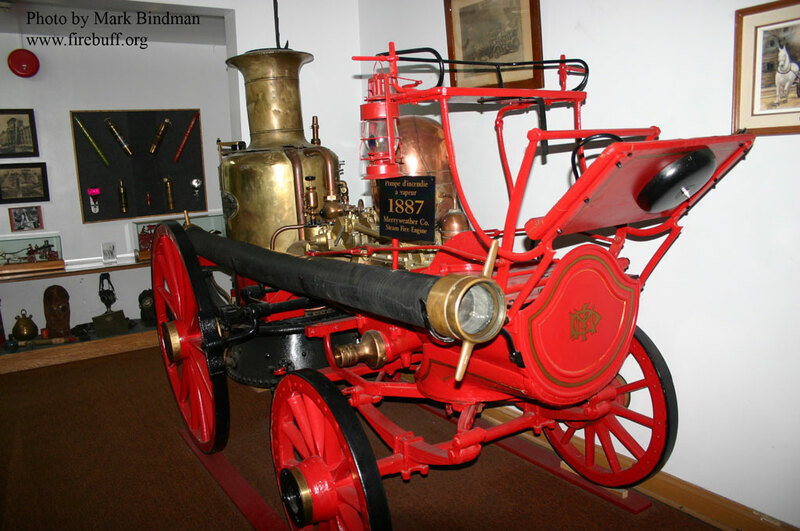 Our steamer dates to the 1890's and has been moved into the museum for exhibition. 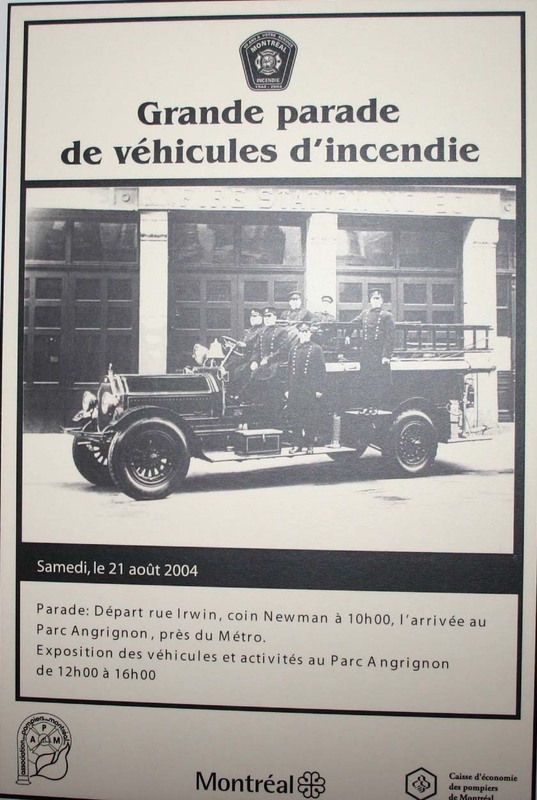 Please come down to see it, it is magnificant. 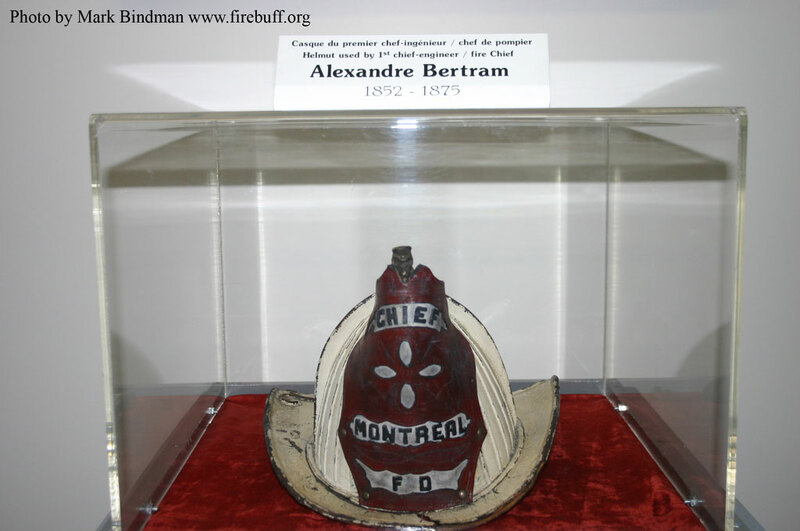 Exhibits pay hommage to Montreal and area's bravest who made the ultimate sacrifice. 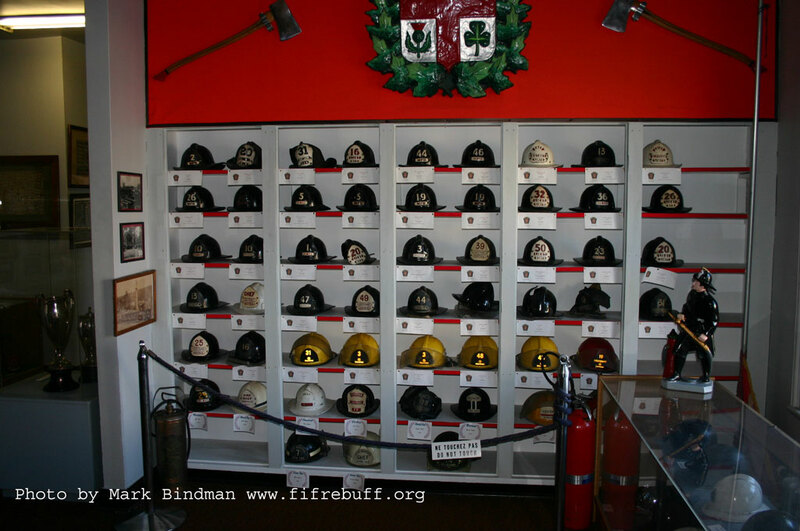 One wall contains the helmets worn by these brave men. 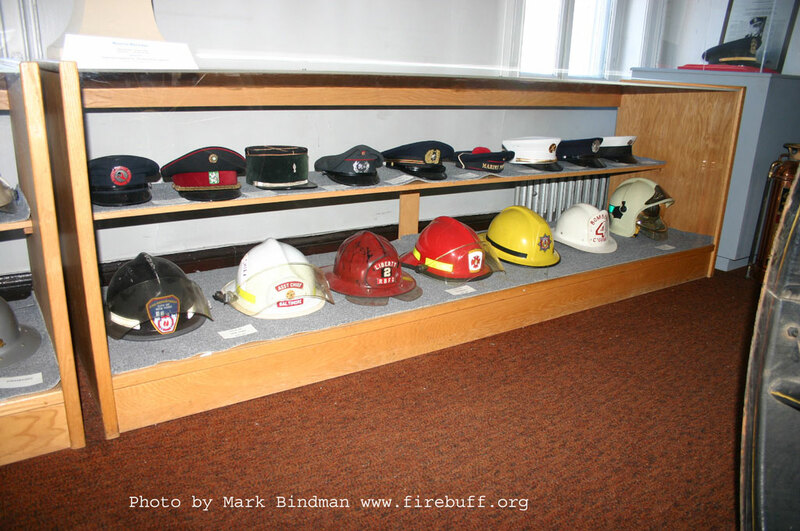 Some of the helmets are only pieces. 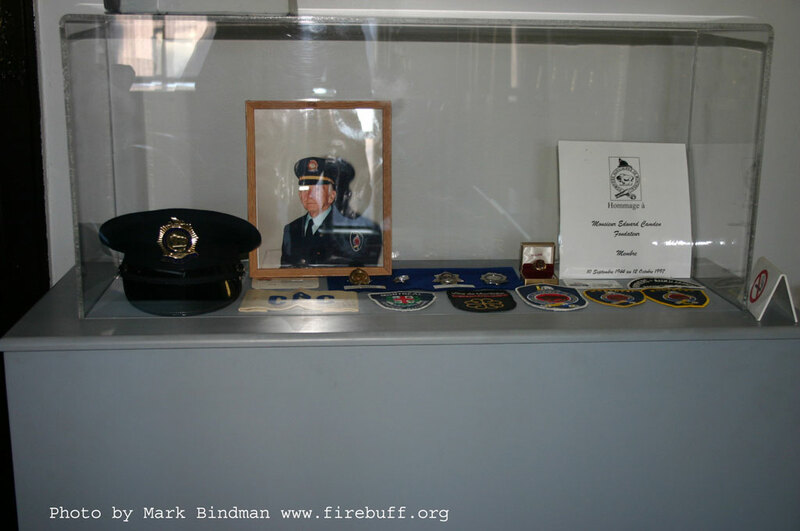 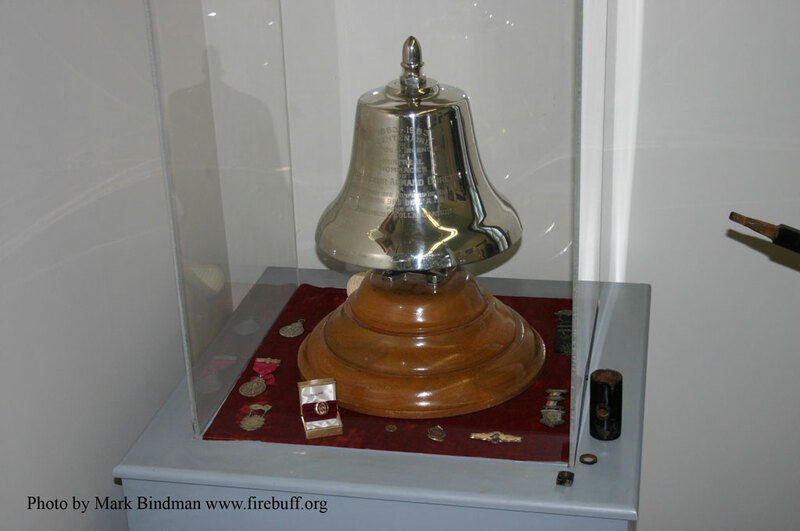 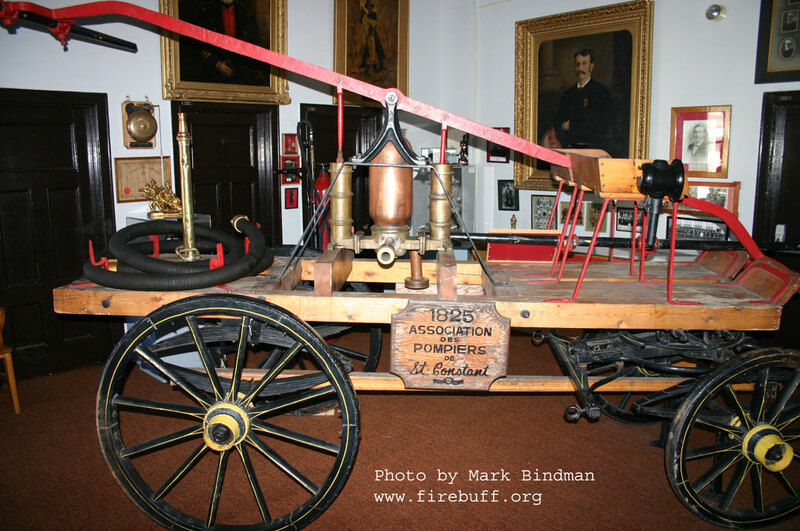 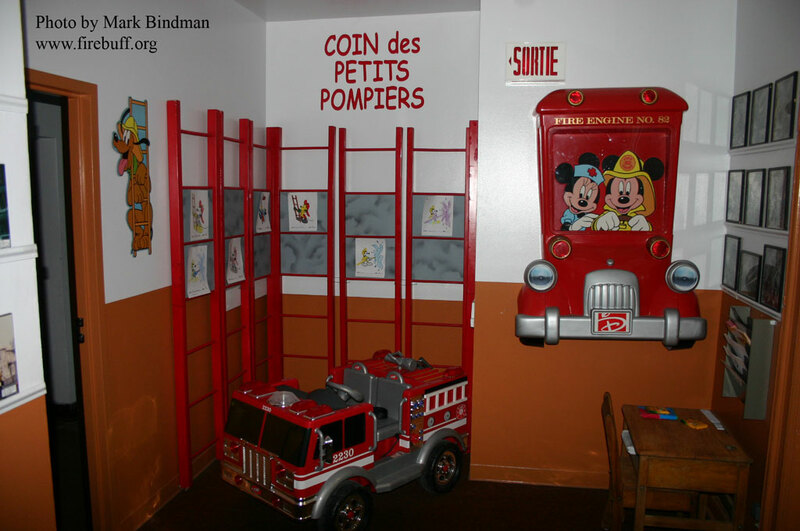 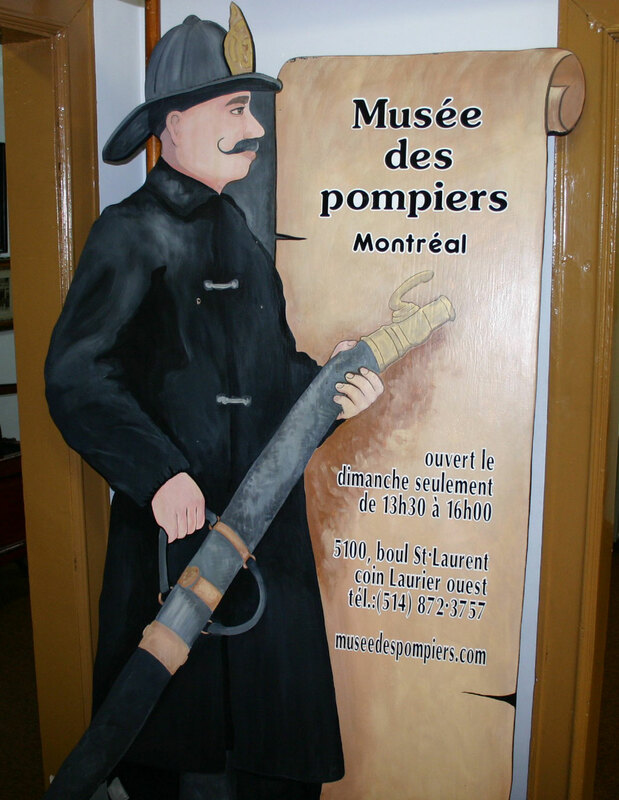 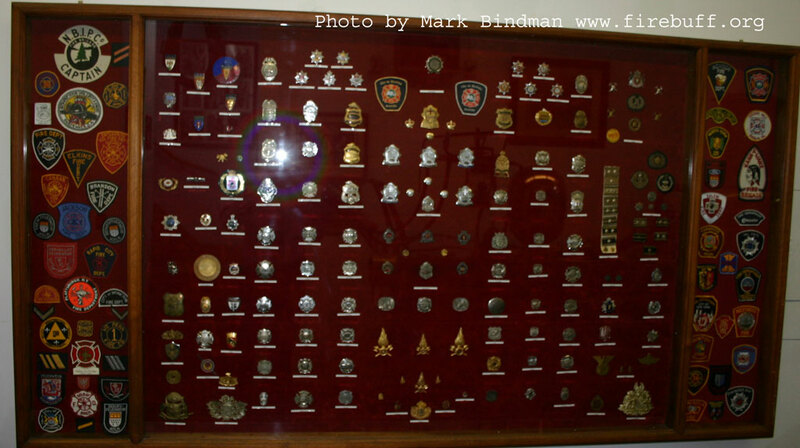 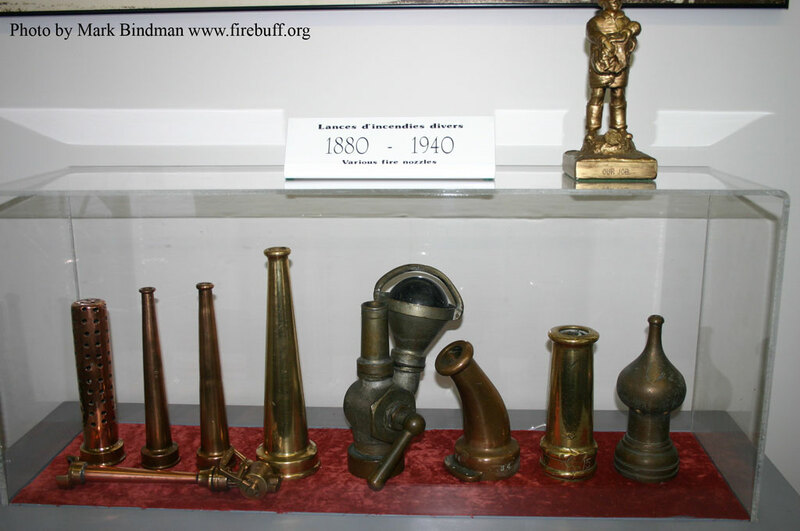 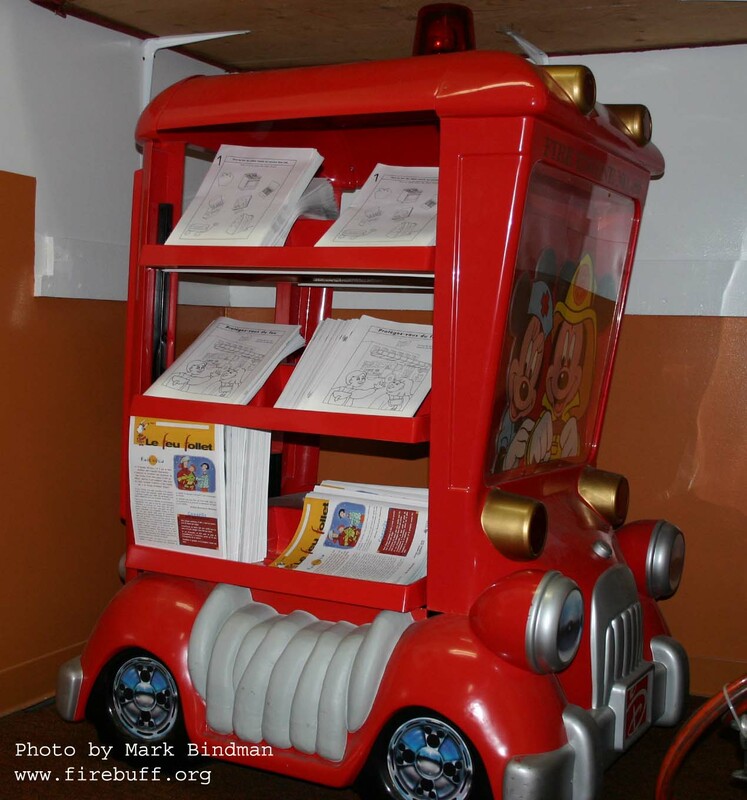 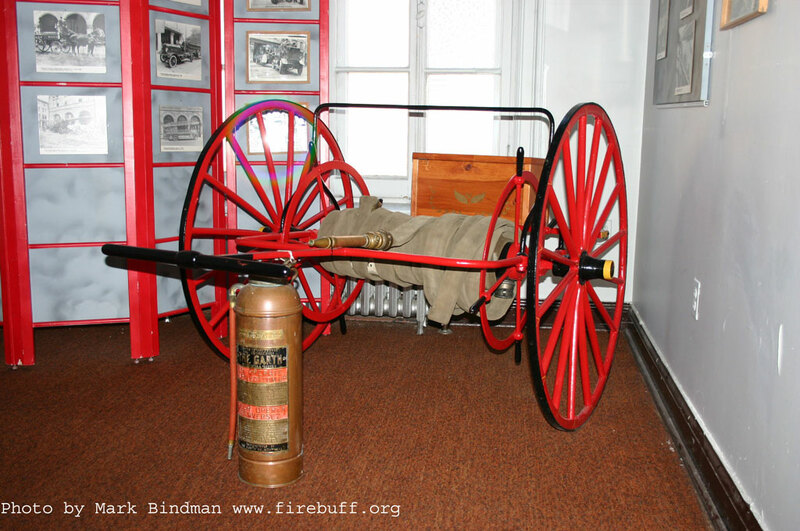 The museum also chronicles the history of the Pompiers Auxiliaires de Montreal since its inception in 1944. 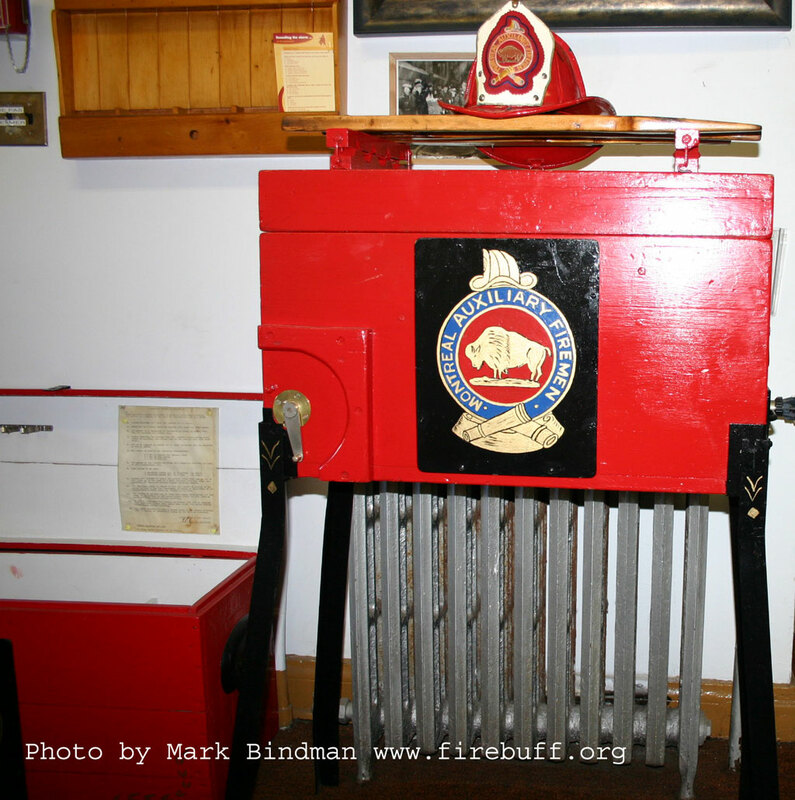 Below is the first canteen used to provide support at major fires. 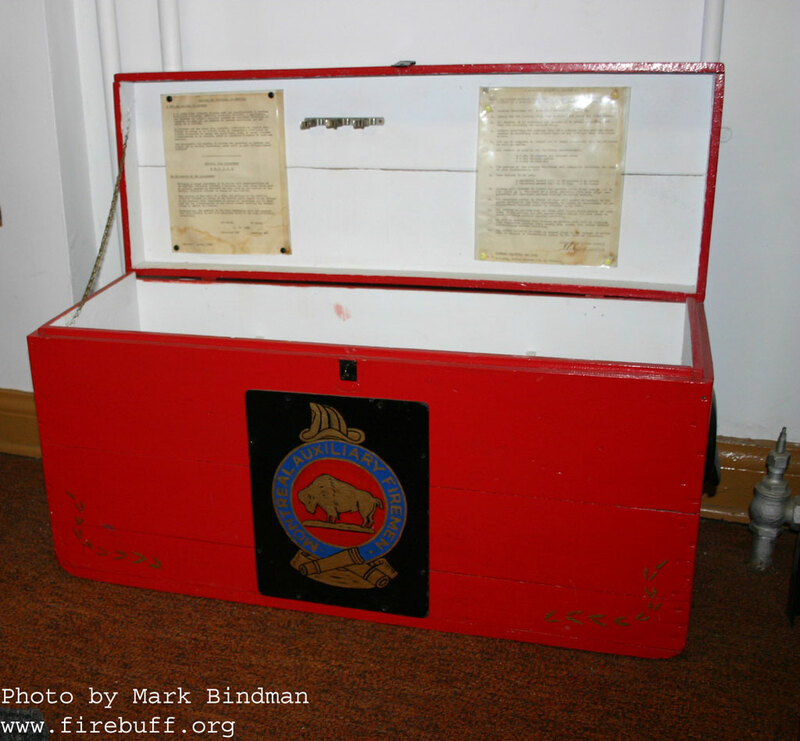 The members would bring this thermos box to the nearest station to the incident, make coffee and then transport it to the scene. 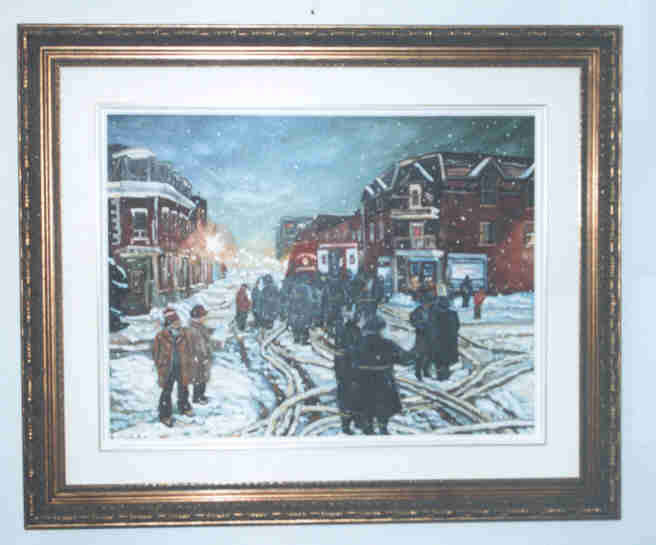 This painting, by the sister of Alain Michaud (the former Director of the Montreal Fire Department) depicts the canteen at work at a fire scene. 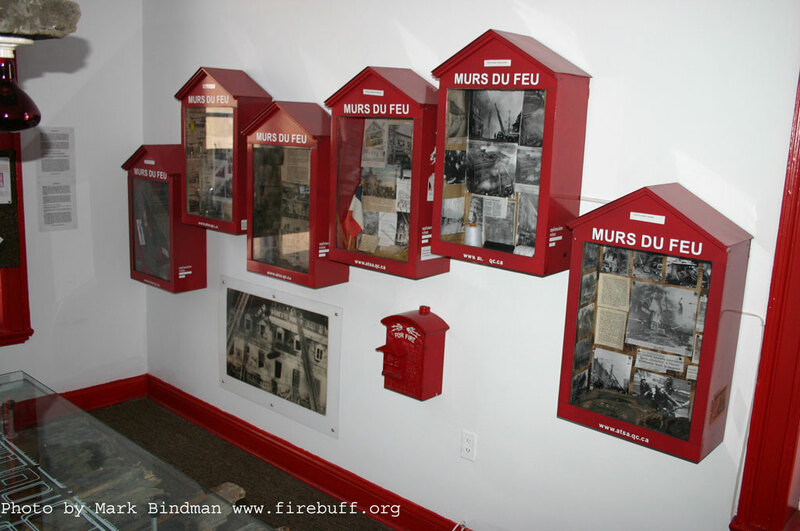 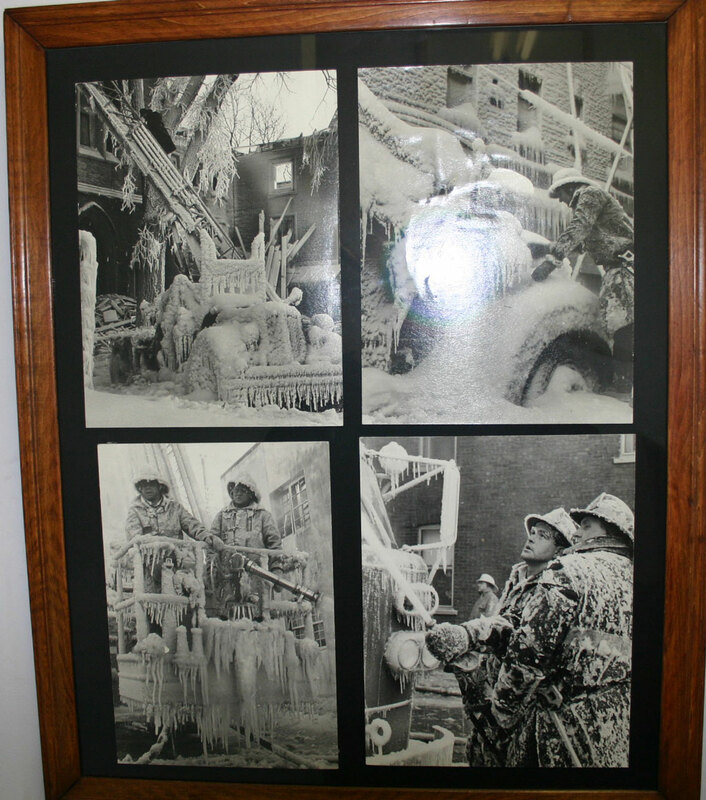 In recent years, another organization mounted an exhibit detailing the history of various major fires on Boulevard St. Laurent. 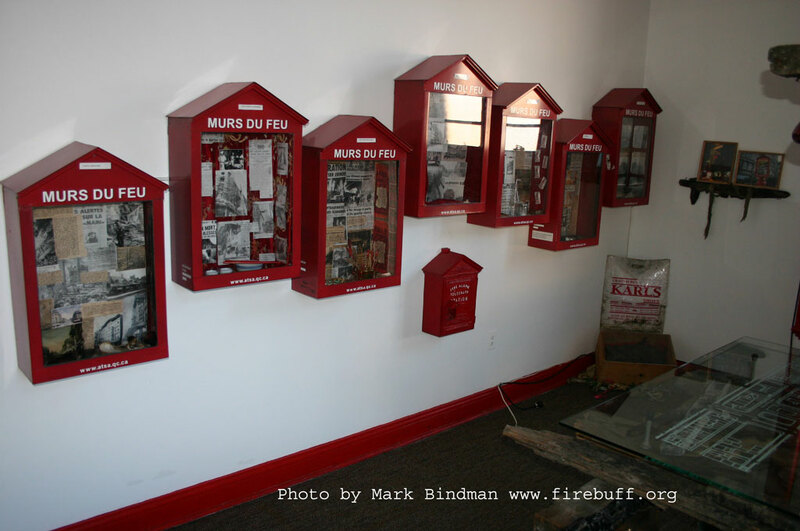 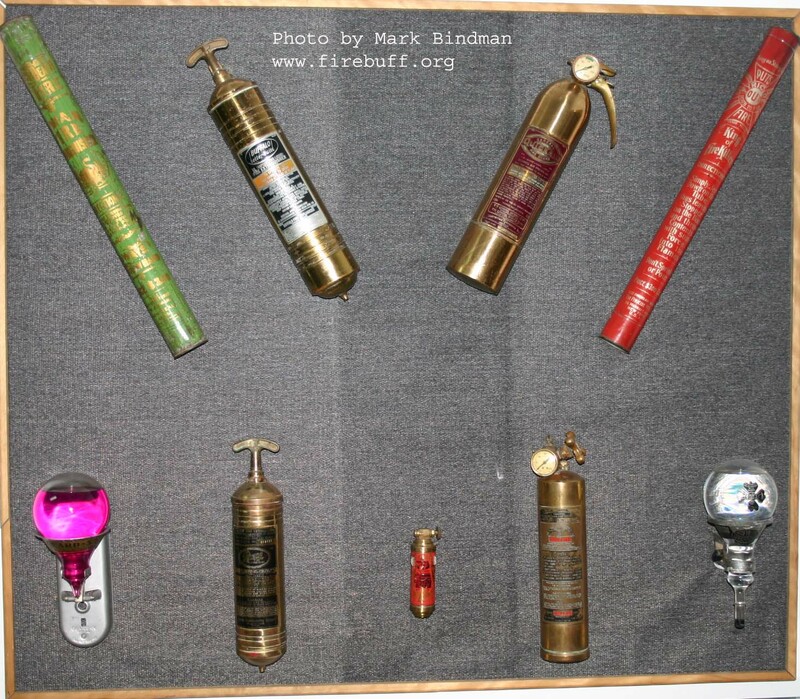 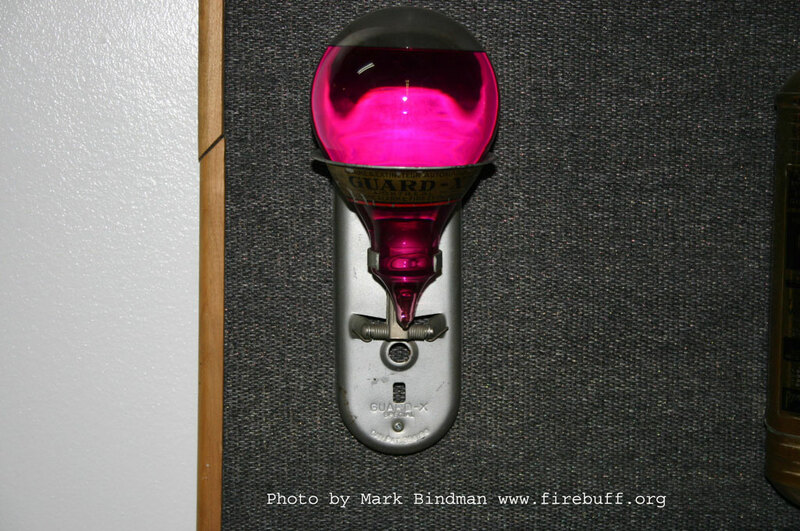 The exhibit involved mounting imitation fire alarm boxes on street corners near the sites of these fires. 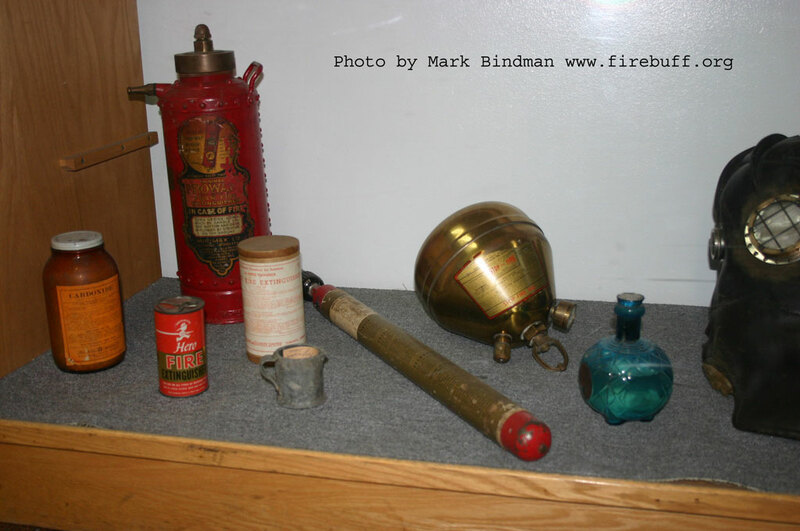 The boxes contained newspaper clippings, photos and artifacts describing these fires. 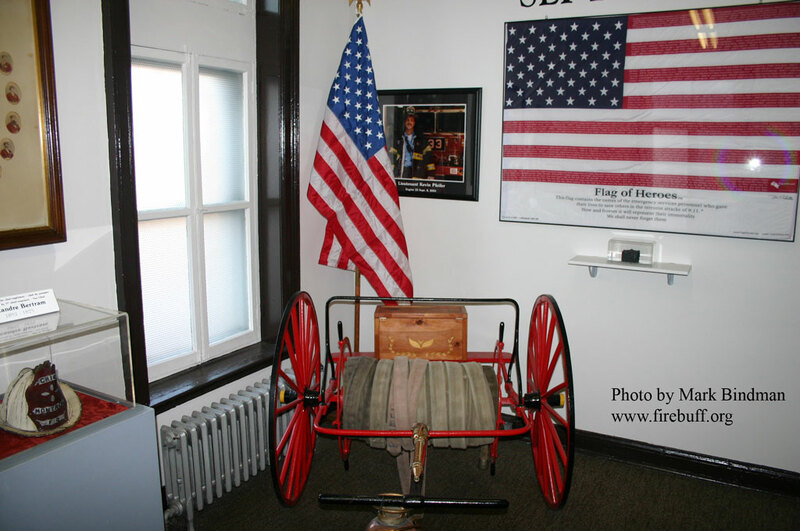 Our museum is proud to reproduce the exhibit on our second floor. 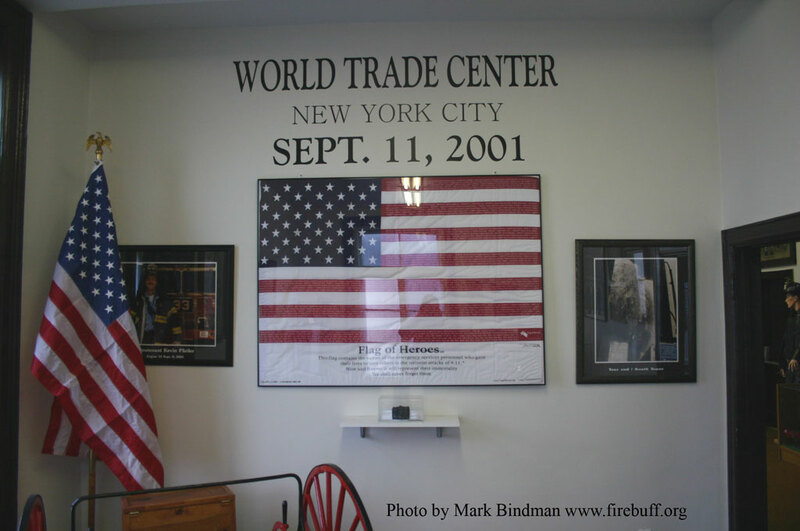 Our Museum also pays homage to those who lost their lives on September 11.2001. 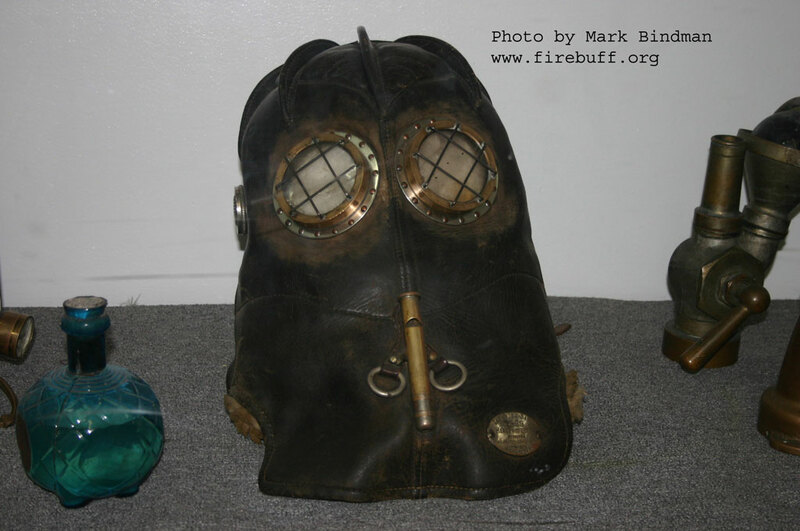 This helmet dates back to the 1850's, before Montreal had a full time fire department. 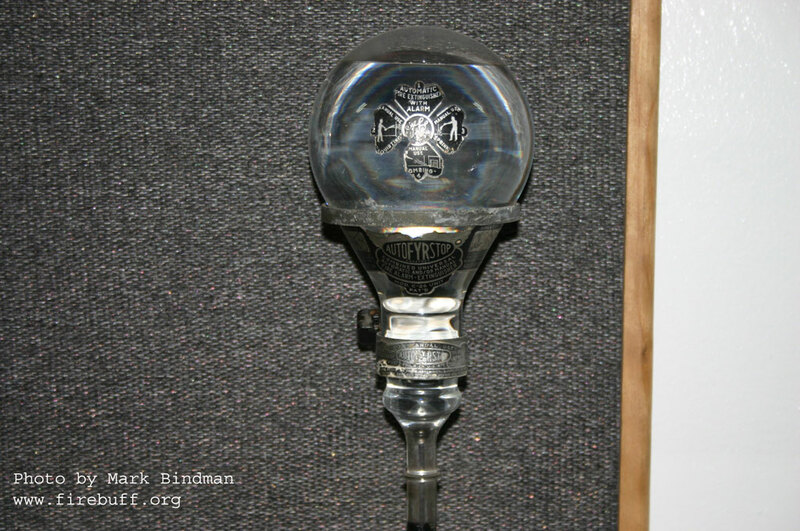 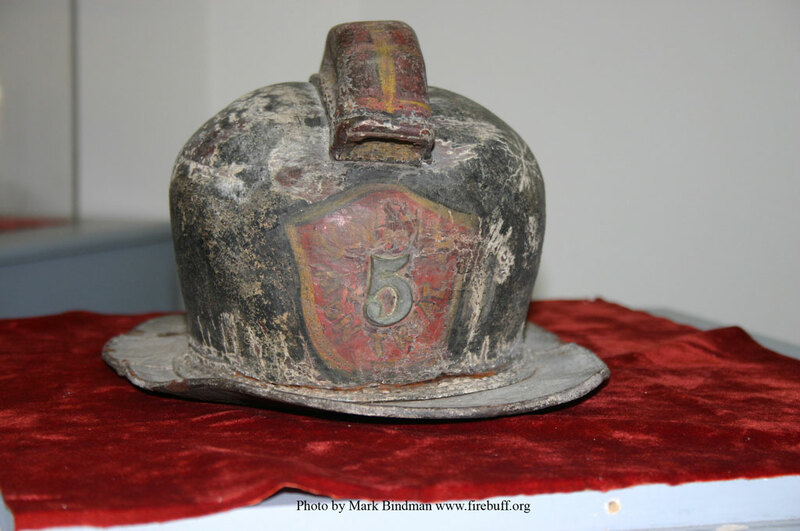 The helmet was from Union Fire Company #5.